Poussin painted a pendant to this painting, Landscape with a Storm,now in a museum in Rouen. Together their contrasting weather effects embody nature's changing and unpredictable relationship with man. Poussin painted these works for the Parisian merchant Jean Pointel, a friend and a great collector of his landscape paintings. probably Peter Delmé II, Esq., M.P., 1710 - 1770 (Grosvenor Square, London, England), by inheritance to his son, Peter Delmé III, 1770.
probably Peter Delmé III, Esq., 1748 - 1789 (Titchfield Place, Hampshire, England; Erle Stoke, Wiltshire, England; Canon Hill, Braywick, Berkshire, England), upon his death, held in trust by the estate. James Morrison, 1789 - 1857 (Basildon Park, Berkshire, England), by inheritance to his eldest son, Charles Morrison, 1857. Charles Morrison, 1817 - 1909 (Basildon Park, Berkshire, England), by inheritance to his sister, Ellen Morrison, June 1909. Ellen Morrison, 1834 - 1909 (Basildon Park, Berkshire, England), by inheritance to her brother, Walter Morrison, December 1909. Walter Morrison, 1836 - 1921 (Basildon Park, Berkshire, England), by gift to his nephew, James Archibald Morrison, 1910. Major James Archibald Morrison, 1873 - 1934 (Basildon Park, Berkshire, England; Sudeley Castle, Winchcombe, England), by inheritance to his daughter, Mary (Morrison) Dent-Brocklehurst, 1934. Mary (Morrison) Dent-Brocklehurst, 1902 - 1988 (Sudeley Castle, Winchcombe, England), by inheritance to her son, (Geoffrey) Mark Dent-Brocklehurst, 1949. (Geoffrey) Mark Dent-Brocklehurst, English, 1932 - 1972 (Sudeley Castle, Winchcombe, England), by inheritance to his wife, Mary Elizabeth (Chipps) Dent-Brocklehurst, 1972. Dent-Brocklehurst Family, 2017 (Sudeley Castle, Winchcombe, England) [withdrawn, Sotheby's, London, March 1974, as by Gaspar Dughet], sold to the J. Paul Getty Museum, 1997. Szanto, Mickaël. "Poussin et ses amitiés chrétiennes: 'Passegiare la terra con la mente fissa nel cielo'." In Poussin et Dieu, exh. cat. Nicolas Milovanovi and Mickaël Szanto, eds. (Paris: Musée du Louvre, 2015), pp. 51-52, fig. 26. Félibien, André. Entretiens sur les vies et sur les ouvrages des plus excellens peintres anciens et modernes. 4 vols. (Paris: Sebastien Mabre-Cramoisy, 1666-85), vol. 4 (1685), pp. 63, 303. Christie's, London. Italian, French, Flemish and Dutch Pictures [...] Late the Property of Peter Delme, Esq. February 13, 1790, p. 4, lot 60. Coxe, Burrell, and Foster, London. Capital Paintings, the Property of the Late [...] Marquis of Lansdowne [...] of Lansdowne House. March 20, 1806, p. 7, lot 46. Phillips, London. Collection of Pictures of the Dutch, Flemish, and Italian Schools [...] the Sole Property of Lord Radstock [...]. April 19, 1823, lot 69. Christie's, London. Italian, French, Flemish, and Dutch Pictures, of the Right Honourable Admiral Lord Radstock. May 12, 1826, p. 8, lot 35. Waagen, Gustav Friedrich. Treasures of Art in Great Britian: Being an Account of the Chief Collections of Paintings, Drawings, Sculptures, Illuminated Mss., &c., &c. 3 vols. (London: John Murray, 1854), vol. 2, p. 262. Waagen, Gustav Friedrich. Galleries and Cabinets of Art in Great Britain: Being an Account of More than Forty Collections of Paintings, Drawings, Sculptures, Mss. [...] Visited in 1854 and 1856, and Now for the First Time Described, A Supplement to Treasures of Art in Great Britain (London: John Murray, 1857), p. 107. Morrison, James Archibald. Catalogue of Pictures at Basildon Park, Berkshire (Oxford: Horace Hart, 1910), p. 28, as Gaspar Poussin. A Catalogue of the Pictures in the III National Loan Exhibition: Pictures from the Basildon Park and Fonthill Collections. [..] held at the Grosvenor Gallery, exh. cat. (London: W. Clowes, 1914), p. 40, no. 19, as G. Poussin (Dughet). Catalogue of the Pictures at Basildon Park. The Property of Captain Archibald Morrison. Typescript, unpublished, n.d, unpaginated, no. 101. Phillips, Sir Claude. "Grosvenor Gallery. National Loan Exhibition." The Daily Telegraph [London] (December 15, 1914), p. 5. Vertue, George. Walpole Society 22, Vertue Note Books (1933-34), vol. 3, p. 117. Sotheby & Co., London. Important Old Master Paintings. March 27, 1974, p. 14, lot 14, ill.
Blunt, Anthony. "Landscape by Gaspard, Figures by Nicolas." Burlington Magazine 117, no. 870 (September 1975), p. 608. Thuillier, Jacques. "Poussin et le paysage tragique: 'l'Orage Pointel' au musée des Beaux-Arts de Rouen." La Revue du Louvre 26 (1976), pp. 345, 346, 352, 355n35. Whitfield, Clovis. "Nicolas Poussin's 'Orage' and 'Temps Calme.'" Burlington Magazine 119, no. 886 (January 1977), pp. 4-12, fig. 3. Rosenberg, Pierre, et al., eds. Nicolas Poussin, 1594-1665, exh. cat. (Rome: Edizioni dell'Elefante, 1977), pp. 207-14, no. 35, ill.
Rosenberg, Pierre, et al., eds. Nicolas Poussin, 1594-1665, exh. cat. (Düsseldorf: Städtische Kunsthalle, 1978), pp. 9, 10, 58, 122-23, no. 35, ill., entry by Pierre Rosenberg. Blunt, Anthony. "Provençal Painting at Marseilles." Burlington Magazine 120, no. 908 (November 1978), p. 781. Thullier, Jacques, and Claude Mignot. "Collectionneur et peintre au XVIIe siècle: Pointel et Poussin." Revue de l'Art 39 (1978), pp. 41, 50, no. 10, ill.
Wild, Doris. Nicolas Poussin. 2 vols. (Zurich: Orell Füssli Verlag, 1980), vol. 1, pp. 130-33, 135, 137, 213, ill.
Wild, Doris. Nicolas Poussin. 2 vols. (Zurich: Orell Füssli Verlag, 1980), vol. 2, no. 172b, ill.
Wright, Christopher. Poussin, Paintings: A Catalogue Raisonné (London: Hippocrene Books, 1985), pp. 99, 214-16, 254, 281, no. 164, fig. 183. Rosenberg, Pierre, and Marion C. Stewart. French Paintings, 1500-1825: The Fine Arts Museums of San Francisco (San Francisco: The Fine Arts Museums of San Francisco, 1987), p. 87. Maek-Gérard, Michael, et al., eds. Nicolas Poussin, Claude Lorrain: Zu den Bildern im Städel, exh. cat. (Frankfurt: Städtische Galerie and Städelschen Kunstinstitut, 1988), pp. 73-75, no. P7, ill.
Bätschmann, Oskar. Nicolas Poussin: Dialectics of Painting (London: Reaktion, 1990), pp. 97, 100, fig. 87. Lagerlöf, Margaretha Rossholm. Ideal Landscape: Annibale Carracci, Nicolas Poussin and Claude Lorrain (New Haven and London: Yale University Press, 1990), pp. 54, 59, 60, 138, 178, pl. 38. Mérot, Alain. Poussin (Paris: Hazan, 1990), pp. 130, 157, 160, 162, 296, no. 239, ill.
Marin, Louis. "Deposition du Temps dans la Representation Peinte." Nouvelle Revue de Psychanalyse 44 (1990), pp. 56, 64-66, fig. 6. Verdi, Richard. Cézanne and Poussin: The Classical Vision of Landscape, exh. cat. (Edinburgh and London: National Galleries of Scotland, with Lund Humphries Publishers, 1990), p. 111, no. 24, ill.
Carrier, David. Poussin's Paintings: A Study in Art-Historical Methodology (University Park: Pennsylvania State University Press, 1993), pp. 82, 156-58, 184. Thuillier, Jacques. Nicolas Poussin (Paris: Flammarion, 1994), pp. 66, 129, 261, no. 201. Rosenberg, Pierre, and Louis-Antoine Prat, eds. Nicolas Poussin, 1594-1665, exh. cat. (Paris: Galeries nationales du Grand Palais, 1995), pp. 105, 449-51, no. 201, ill., entry by Pierre Rosenberg. Mérot, Alain. "Les modes, ou le paradoxe du peintre." In Nicolas Poussin, 1594-1665, exh. cat. Pierre Rosenberg and Louise-Antoine Prat, eds. (Paris: Galeries nationales du Grand Palais, 1994), p. 84. Verdi, Richard, and Pierre Rosenberg, eds. Nicolas Poussin, 1594-1665, exh. cat. (London: Royal Academy of Arts, with Zwemmer, 1995), pp. 286-87, no. 73, pl. 73. McTighe, Sheila. Nicolas Poussin's Landscape Allegories (Cambridge: Cambridge University Press, 1996), pp. 32, 34, 37-38, 42, 43, 52, pl. 2. Allen, Denise and David Jaffé. "Poussin's 'A Calm' and 'A Storm'." Apollo 147, no. 436 (June 1998), pp. 28-34, figs. 1, 4, 5. Pétry-Parisot, Claude. Caravage-Poussin: Le génie réaliste de Caravage s'oppose-t-il à la poésie peinte de Poussin?, exh. brochure (Rouen: Musée des Beaux-Arts de Rouen, 1998), p. 8, fig. 3. Feigen, Richard. Tales from the Art Crypt: The Painters, the Museums, the Curators, the Collectors, the Auctions, the Art (New York: Alfred A. Knopf, 2000), pp. 66-69, ill.
Scholz-Hänsel, Michael. Jusepe de Ribera, 1591-1652 (Cologne: Könemann, 2000), pp. 80, 82, fig. 72. Walsh, John. Poussin Landscapes by Leon Kossoff, exh. brochure (Los Angeles: The J. Paul Getty Museum, 2000), fig. 3. Kendall, Richard, ed. Drawn to Painting: Leon Kossoff, Drawings and Prints After Nicolas Poussin, exh. cat. (Los Angeles: Los Angeles County Museum of Art and J. Paul Getty Museum, with Merrell, 2000), pp. 45, 48-51, 125, pl. 66. The J. Paul Getty Museum Handbook of the Collections. 6th ed. (Los Angeles: J. Paul Getty Museum, 2001), pp. 126-27, cover ill., ill.
Olson, Todd P. Poussin and France: Painting, Humanism, and the Politics of Style (New Haven and London: Yale University Press, 2002), pp. 212, 217, 218, 220, 224, 233, 239-40, 241, 293n75, figs. 102, 118, 123. Allen, Denise, et al. Masterpieces of Painting in the J. Paul Getty Museum. Rev. ed. (Los Angeles: J. Paul Getty Museum, with Thames & Hudson, 2003), pp. 74-75, no. 39, ill., entry by Jon L. Seydl. Unglaub, Jonathan. "Poussin's Reflection." Art Bulletin 86, no. 3 (September 2004), pp. 505, 508, ill.
Stratford, Linda. "French Identities in Landscape Imagery." In A Romance with the Landscape: Realism to Impressionism, exh. cat. Janie M. Welker and Linda Stratford, eds. (Lexington: University of Kentucky Art Museum, 2006), pp. 31, 32, fig. 11. Os, Henk van, ed. Dreaming of Italy, exh. cat. (The Hague: Mauritshuis, 2006), pp. 62-64, 126, no. 33, fig. 18. The J. Paul Getty Museum Handbook of the Collections. 7th ed. (Los Angeles: J. Paul Getty Museum, 2007), pp. 118-19, ill.
Rosenberg, Pierre, and Keith Christiansen, eds. Poussin and Nature: Arcadian Visions (New York: Metropolitan Museum of Art, with Yale University Press, 2008), pp. 187, 260-63, no. 56, ill; p. 224, under no. 41; p. 234, under no. 45; p. 236, under no. 46; p. 250, under no. 51; p. 252, under no. 52. Christiansen, Keith. "The Critical Fortunes of Poussin's Landscapes." In Poussin and Nature: Arcadian Visions, exh. cat. Pierre Rosenberg and Keith Christiansen, eds. (New York: Metropolitan Museum of Art, with Yale University Press, 2008), pp. 12, 16, 21, 24, 30, 34n48. Pace, Claire. "'Peace and Tranquility of Mind': The Theme of Retreat and Poussin's Landscape." In Poussin and Nature: Arcadian Visions, exh. cat. Pierre Rosenberg and Keith Christiansen, eds. (New York: Metropolitan Museum of Art, with Yale University Press, 2008), pp. 74, 81. Démoris, René. "From 'The Storm' to 'The Flood.'" 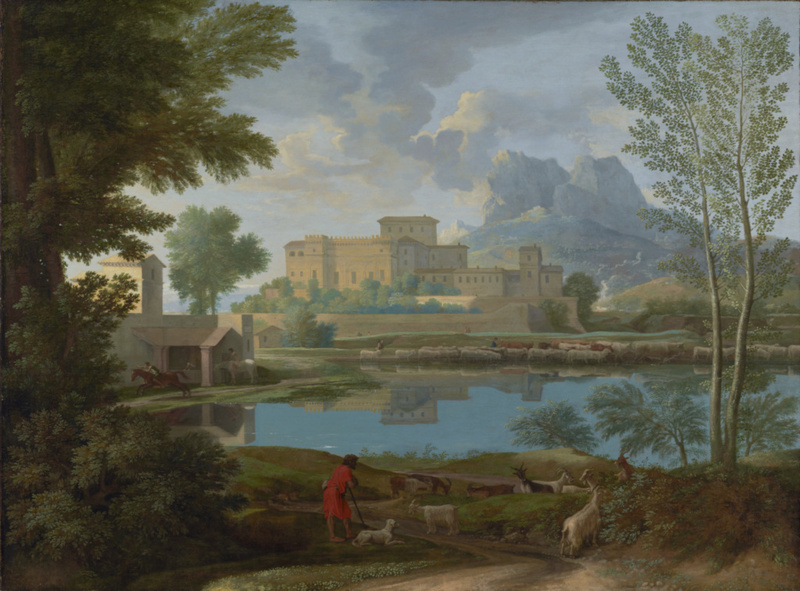 In Poussin and Nature: Arcadian Visions, exh. cat. Pierre Rosenberg and Keith Christiansen, eds. (New York: Metropolitan Museum of Art, with Yale University Press, 2008), p. 97. Morra, Joanne. "The Work of Research: Remembering, Repeating, and Working-Through." In What is Research in the Visual Arts. Michael Ann Holly and Marquard Smith, eds. (Williamstown: The Sterling and Francine Clark Art Institute, 2008), pp. 55-56, fig. 4. Schlesser, Thomas. Cent énigmes de la peinture: la beauté (Paris: Hazan, 2010), pp. 122-25, ill.
Braider, Christopher. The Matter of Mind: Reason and Experience in the Age of Descartes (Toronto: University of Toronto Press, 2012), pp. 91, 93, 108, 120-21, fig. 8. Viguerie, Laurence de, Philippe Walter, and Helen Glanville. "Some Preliminary Remarks on Nicolas Poussin's Painting Technique in L'Orange: Complementary X-ray Fluorescence and X-ray Diffraction Study." La Rivista del Restauro 27, no. 46 (April-September 2014), pp. 97-98, figs. 2, 99, 103. Students create a postcard of a landscape using rubbings to create texture, and write a letter on the postcard describing their landscape. Students write a friendly letter about their observations of a painting by Poussin with new vocabulary found using a thesaurus. Students write a postcard about their favorite landscape. Students make connections between their personal experiences and landscapes.